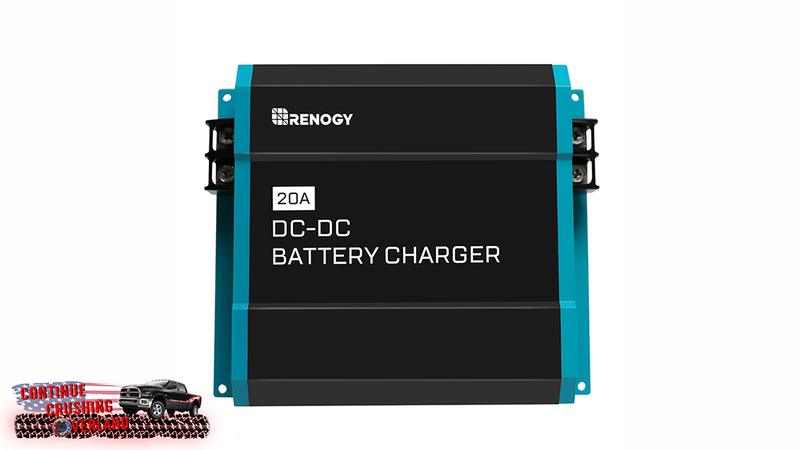 Renogy has a new DC to DC charger unit on amazon for $129 if anyone is on the fence about solenoids and such. Has 3 stage charge and can handle flooded, agm, gel, and lithium. Output is 20 or 40 amps ($199) depending on model, but 20a is nice for those who don't wanna install huge wire (of course bigger is always better). OK. Without going through the past 70 pages (because I know it's been mentioned! ), exactly how big of a wire would I have to use for this 20A charger? what is the round-trip distance? Length of Conductor is both positive and negative wiring combined. Like other said, depends on distance. Short stuff you could do 10 awg, but I’d go larger if possible, even on short runs. Wow. Thanks for the quick replies! This is really a great forum. I've always assumed that the frame is a zero resistance conductor when I use it for the negative return. What do others say? yeah thats fine, however if your going to pull some serious amps through the chassis you should have redundant grounding paths for battery/engine (alt).. I once had engine ground strap fail and the path to ground for the starter was a throttle cable, bet yeh can guess how that turned out. I only recommend using chassis return for cheap, unimportant and low current devices. Don't do it much at all myself. Great advice. I’ve got quite a lot in my 80, but I should replace a couple of them. I do not want to interup a conversation here, and hope it will continue, but I just got a flash about the title of this tread. Are we still in the 50,00$ original target or this tread, or did it turn out that is it not doable? That is in order to have something safe and reliable. The $50 is totally doable. But there is more than one way to skin a cat. This is the solution I've been exploring as an alternative to the traditional solenoid system but during my research I found this charger which acts as a DC to DC charger with multiple charging profiles (LIFePo, Lead Acid, Gel, etc.) AND also has a built in MPPT solar charge controller and inputs for solar. It's a bit more expensive than the Renogy charger but the added utility of the MPPT charge controller is worth it in my opinion. The body is sitting on rubber bushings, and the original negative wire is not suited for heavy or distant installations. I’ve added a second negative wire to the frame (10awg easier then replacing the original one). And added a new negative wire from the frame to the trucks bed. I can see the difference before and after.